A quick and easy, classic Italian entree that's simple, elegant and delicious. 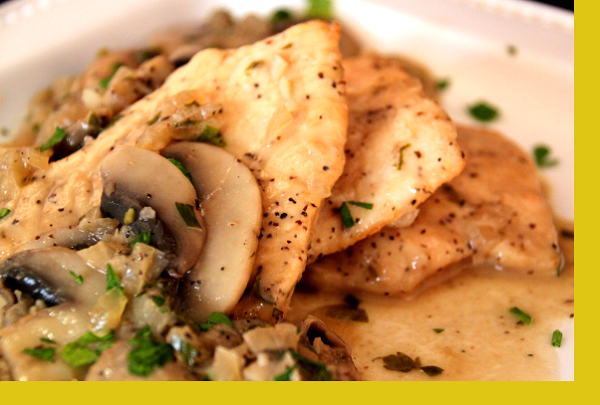 Chicken breast cutlets sauteed in a marsala wine, mushroom, onion and garlic reduction. The chicken is thinly sliced and pounded to make cooking chicken nearly foolproof. Served with a delicious side of green beans with almonds. One of my favorites easy to prepare. I actually cooked the beans in my microwave. Easy and delicious! One of my favorites. We added pasta to complete the meal. This was so good and pretty easy to prepare. The green beans were so so good. We enjoyed this meal very much and will definitely order again! This is fabulous, easy, tasty! 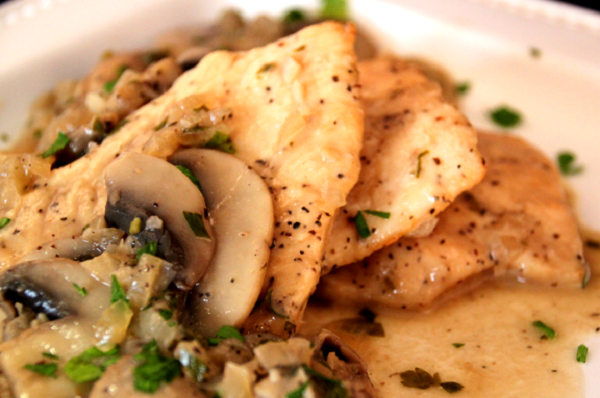 Cooked the chicken Marsala last night! 5 stars! Dredged the fresh chicken (already portioned and flattened, filets) in flour, sautéed in 3 tbs olive oil. 3 minutes a side and poured the mushroom Marsala sauce over the chicken and covered for 5 minutes…I added some capellini buttered noodles and portioned chicken and sauce on top of noodles…the fresh beautiful green beans were cooked for 5 minutes ( I used a cup of chicken stock instead of water) and topped them with the scrumptious toasted almond mixture provided in a baggy! Just delicious! Loved having a green vegetable…Maria's food is just outstanding, 2 servings actually can feed 4 easily, everything is portioned perfectly and all do fresh! I have been using the service now for over a year weekly! The packaging with ice in a cooler bag is perfect and they recycle! The delivery folks, especially Rocco, are lovely and so helpful! If I were asked I would do their TV ads if they had any!!! delicious sauce and lots of mushrooms.. liked the green beans too..
this was easy and tasted great. My son loved it. I love this chicken and it has become my favorite. Taste is amazing! This dinner, like all others, was easy to prepare and came with generous portions. I'm continuosly amazed with the offerings and never disappointed.